AUTHOR CREDENTIALS: Tim Crothers was the former senior writer at Sports Illustrated. C0-Author of Hard Work: A life On and Off the Court: Rose to #15 on the New York Times Best Sellers List. It is a biography of Roy Williams (other Co-Author). Roy Williams has the highest winning percentage among all active college coaches. INTENDED AUDIENCE: FANS OF THE GAME OF BASKETBALL. A BOOK FOR ALL AGES AND GENDERS. To purchase this enjoyable book about Hall of Fame Coach Roy Williams! Currently the head coach of the UNC Tar Heels Men’s Basketball team, Roy Williams has won two NCAA Championships with the Tar Heels and brought his teams (both UNC and Kansas) to seven Final Fours. Inducted into the Naismith Hall of Fame in 2007, he ranks first in the country in winning percentages among active coaches. Born in Asheville, North Carolina, he rose from Assistant Coach at UNC to Head Coach at Kansas, where he coached the Jayhawks for fifteen years before returning to North Carolina in 2004. During his career, he has coached nineteen first-round NBA draft picks, four National Players of the Year, thirteen first-team All-Americas, and seven conference Players of the Year. One of the most respected and successful basketball coaches in the nation, Coach Roy Williams has traveled an unlikely path. In Hard Work¸ he tells the story of his life, from his turbulent childhood through a coaching career with the highest of highs and the lowest of lows. With his new afterword, Williams takes us past the two NCAA championship titles to the subsequent 2010 season, its shake-up losses, the unexpected departure of key players, and on to a new season of coaching some of the most dazzling young players in the country—and a surprising ACC championship. Williams recounts his rough early years; his long tenure as head coach at the University of Kansas; how he recruits, teaches, and motivates his players; how he’s shepherded teams through some of the most nail-biting games at both Kansas and UNC; and how he suffered through one of the roughest seasons of his tenure and came out on the other side to be awarded 2011 ACC Coach of the Year. This is an excellent read and will relate very well to people who love the game of basketball. Roy Williams is a highly respected coach and person who cares about his players. 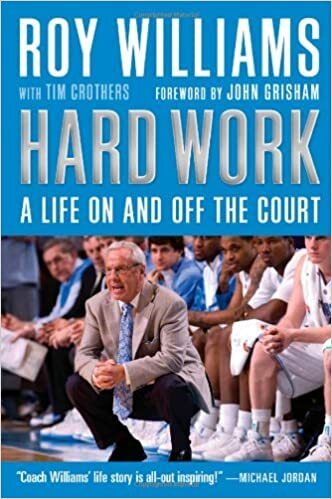 At 288 pages it is a quick and easy read that highlights the struggles Williams had and how he persevered to become a legendary and Hall of Fame Basketball Coach. He is still coaching the University of North Carolina Men’s Basketball team at the age of 65 and has shown no signs of slowing down. If you are a fan of basketball, I would highly recommend this book.